I’ve been working away on Vogue 8766. Its been rather irritating actually as I was rather underwhelmed on the fit of this pattern, it is clearly based on a very different shape to mine. In contrast the bodice of Simplicity 1873 (which I just realised I’ve never blogged) fit me very well (and Simplicity patterns in general seem to fit me well once I do my standard alterations for no-shoulders). Plus I had to do the most massive sway back adjustment I think I have ever needed to do. The extra adjustments are no doubt in part due to the muslin being in a stable cotton and the actual dress being an open weave lace with very drapey silk underlining. So once the dress was mostly assembled I had to do my “method” of making adjustments as I sew which consists on trying the offending item on about a thousand times, pinning, checking, basting, checking, sewing, repeat, repeat, repeat. I finally came up with something I am almost happy with. Almost. The neckline and sleeves on me looked so frumpy on me, which led me down the internet rabbit hole of googling “what is frumpy” and “how to stop a dress from looking frumpy”. After said googling I lowered the neckline slightly and removed the sleeves, which seems to make a difference. I need to tweak a couple of things – namely the neckline is stretched out slightly on one side so I will be sewing some tape to the neckline seam to bring that in again (involves having to undo and restitch the bias facing) plus the waistline position at the back needs to be moved a bit as it somehow manages to still be a bit wonky on one side. on the front bodice is rather more visible than I would like. Le sigh. “home sewing” as I think it does? This fabric is rather special for me as its the first thing I ever won when I started blogging about my sewing. I really really want to do it justice but I am feeling the universe is not agreeing with me at this point. 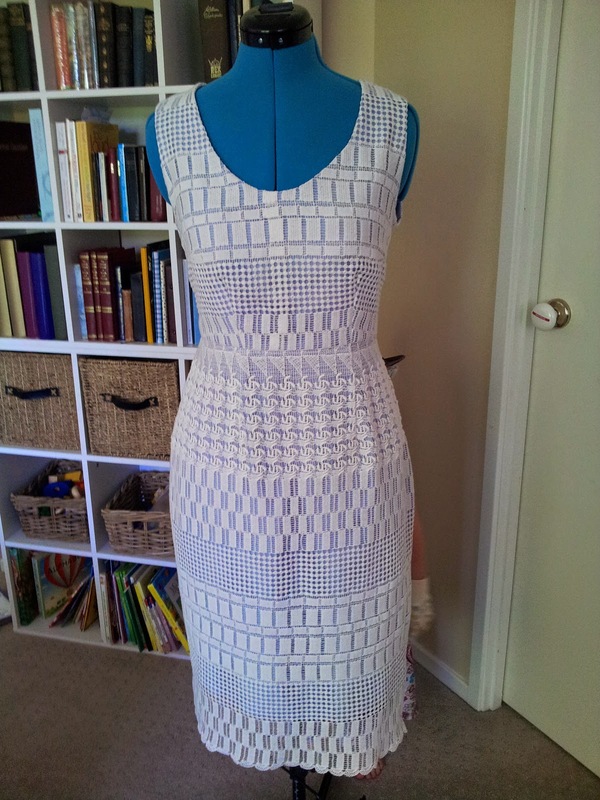 So I need to choose – do I finish fiddling with getting the fit and finish perfect (as perfect as my current skill level can make it) which is a few hours worth of sewing or do you think that the join down the front makes that a waste of time? 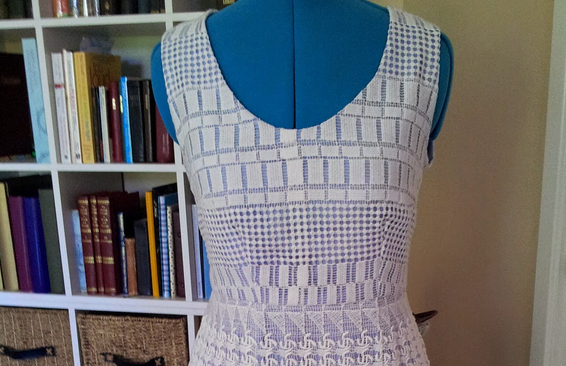 This would still make a lovely pencil skirt – I’d just take off the bodice and add a small waistband. I have no fabric to recut anything – just tiny scraps of the lace, the elbow length sleeves I removed and a very small amount of the silk.